I love curry. So does Ichiro Suzuki of the New York Yankees. I remember watching a television program on Ichiro that reported that when he has home games that his wife makes him curry for breakfast. I found that so fascinating. Curry for breakfast. While I have lived in Singapore and often had curry for breakfast there it roti prata. But in Japan curry is eaten with rice and the concept was so foreign to me. Until I started having curry for breakfast. It’s not something we have at home for breakfast, but it is something I eat when I am taking my breakfast in the city, often at Tsukiji Market. I usually have curry at Indo Curry Nakaei, a shop that is popular with the fishmongers at Tsukiji. Curry for breakfast is a bold start to the day and there are some great options at Tsukiji Market. Another curry shop caught my attention when it was featured on television as a popular night spot at Tsukiji Market. While most of us think of Tsukiji Market as a morning spot there are a handful of restaurants that are open at night. As the inner market of Tsukiji is moving in a few years to Toyosu the outer market vendors are concerned about the future of their business. Some of the shops have started promoting their restaurants as destinations at night, including the Italian hot spot Tsukiji Paradiso, mentioned in an article I wrote for The Japan Times. 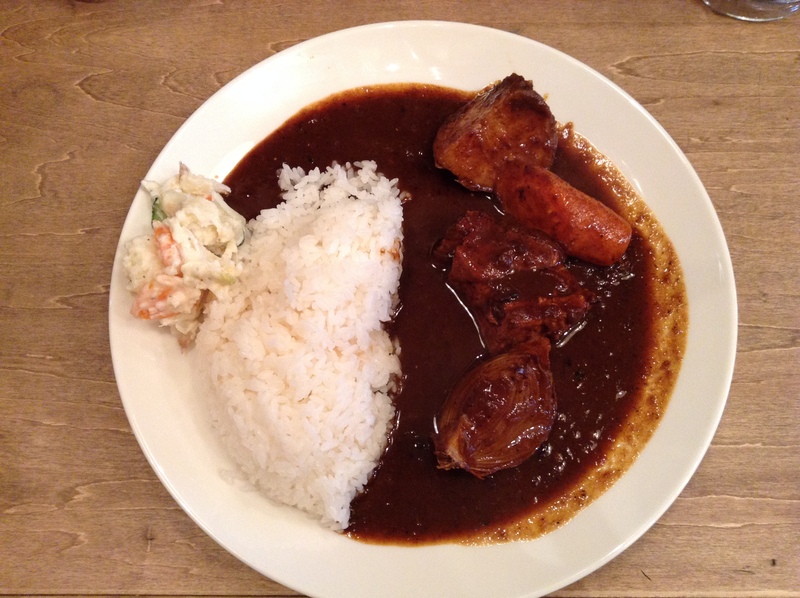 Higashi Indo Curry Shōkai is one of the shops that is open from breakfast to dinner. The original shop is in Fudōmae near Gotanda. The curry (950 JPY) is rich and comes with big chunks of vegetables – carrot, potato, onion, and tender pork. The owner asked me if I liked potato salad and he gave me a bit with my curry. As it was breakfast and curry shops often serve a generous amount of rice I asked for a smaller serving of rice. Even the small serving was a lot to finish. At Shōkai you can have extra curry sauce if you would like, which I gladly accepted. The owner, Akira-san, is very friendly. He used to be a mountaineering guide in Europe. We had a quick chat and I asked him how he went from mountaineering to a curry shop. He said that when he came back to Japan he was working in the wholesale produce section of Tsukiji Market, which led him to opening his first restaurant in Fudomae. Just as I was finishing a local worker came in for curry, ordering a beer to enjoy while waiting for the curry. There are also grilled curry onigiri rice balls for sale in front of the shop. Early in the morning that was the popular menu item. While most people coming to Tsukiji Market are coming to eat sushi, if you are craving something more, consider curry.